Left to right; Territory professional Tyler Muench, champion Michael Boyd and Jeff Simpson of Yamaha Golf Carts. 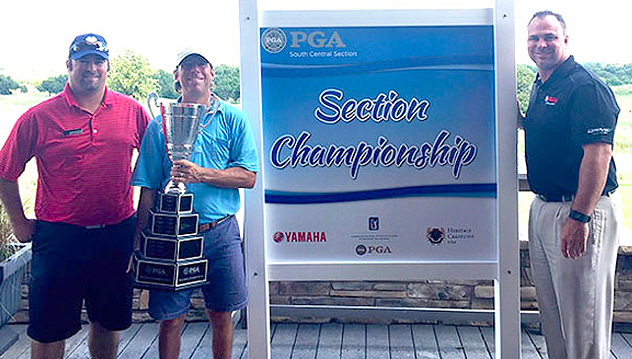 Michael Boyd completed a dominating year in the PGA South Central Section, shooting rounds of 69-70 for a 5-under 139 and a two-shot victory in the SCPGA Section Championship at The Territory Golf Club in Duncan Tuesday. Boyd, who runs his own instruction school at The Club at Indian Springs in Broken Arrow, earlier won the Section Professional Championship at Tulsa Country Club and finished as runnerup to Jarod Lundy in the Section Match Play Championship, probably ensuring his third consecutive SCPGA Player of the Year honor. Young and Boyd were tied for the lead at 3-under after the first round, but Young shot even-par 72 in the second round to fall two shots off the pace. Mike Hansen of Edmond placed third at 2-under (72-70) and Brian Soerensen of Edmond tied with Bruce Baxley of Searcy, Ark., for fourth at 1-under.